Having Argentinean blood means being an empanada addict. So when I came to Barcelona I was so exited that there were so many places that sell them. But of course sometimes the empanadas are a disappointment and have nothing to do with the pastries you eat in Argentina. But then I discovered La Fabrica. 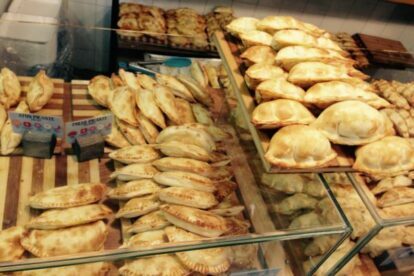 I passed by and saw all these perfectly hand-folded empanadas shining in the vitrine. I entered and discovered the huge list of all kinds of different types. To test if I had finally found the authentic ones, I ordered two of my all time favorites; one with meat and one with ham and cheese. And yes, they took me back to Buenos Aires with the first bite. I even took my father from Argentina there when he visited me to really make sure I wasn’t just hallucinating, but yes, he agreed. Empanadas are perfect as little snacks or, if you take some more, they can even work as a lunch or dinner. If you want to eat them in La Fabrica they heat them up for you in a little oven and you can have them standing at the wall bar; they don’t have tables. But you can also take them home, buy some bottles of wine, and organize an empanada party for your friends!